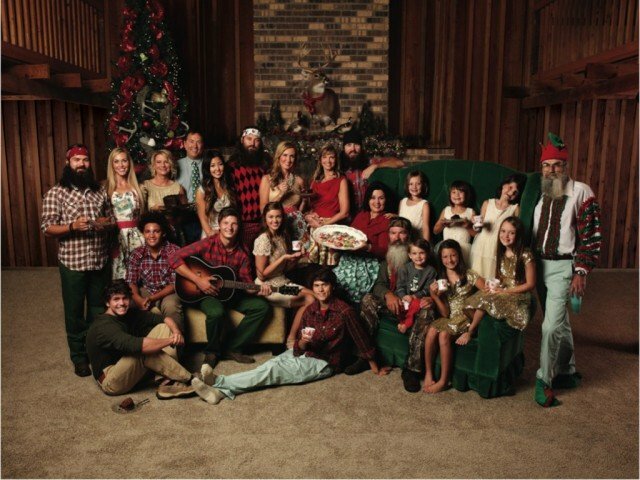 Duck Dynasty ’s Christmas album debuted as No 1 in Billboard’s Top Country Albums chart this week. Duck the Halls: A Robertson Family Christmas debuted this week in the Billboard chart knocking Luke Bryan’s album from first to fourth. The album took over the top spot ahead of Thomas Rhett’s It Goes Like This and Toby Keith’s Drinks After Work, which are also in their first week on the chart. Duck the Halls is also ranked second on the publication’s list of Top Holiday Albums behind Kelly Clarkson’s Wrapped in Red. Duck Dynasty’s album is currently listed as fourth on the Billboard 200, which ranks top-selling albums for the week across all genres. The Christmas record is situated behind new albums from Arcade Fire, Katy Perry and Clarkson. The Robertsons are joined on their album by country music stars like Luke Bryan, Alison Krauss, Josh Turner and George Strait, who won the Country Music Association award for Entertainer of the Year on Wednesday. Duck the Halls features a blend of original songs, such as Ragin’ Cajun Redneck Christmas, and more traditional Christmas tunes, including Rudolph the Red-Nosed Reindeer and I’ll Be Home for Christmas.